Hair loss is a problem that many people suffer from. For men, it is often associated with simply growing older and having a genetic predisposition toward male pattern baldness. For women, it can be another matter altogether, and it is important to tackle the root of the problem – read more about it in my article about 10 causes of hair loss and how to treat them. I’ve discussed a number of natural treatments to promote hair growth such as onion for hair growth, castor oil and rosemary. In this article I want to show you how to use garlic to fight hair loss. Garlic, that wonder-food with so many benefits, can add another item to its long list of home remedy uses: treatment of hair loss. A 2007 study published in the Indian Journal of Dermatology, Venereology and Leprology and performed by dermatological researchers from Iran’s Mazandaran University of Medical Sciences found that topical application of 5% garlic gel to areas where hair loss had taken place led to hair regrowth in the previously bald areas of the scalp, reduction in size of bald patches, and higher hair count numbers. The sulfur and selenium contained within garlic can help fortify the structure of the hair shaft, meaning it can not only help to replenish lost hair, but can strengthen existing hair as well. The vitamins and minerals that each clove of garlic is imbued with can also naturally condition your hair while adding strength. Extract the juice from a small head of garlic or about eight cloves. Do this by peeling each clove and using a garlic press to squeeze the juice from each clove. This should yield about one tablespoon of garlic juice. Blend this juice with an equal amount of honey (which also has amazing health benefits). Apply this salve to your scalp and hair and leave it on for 60 minutes before rinsing out. This should be done twice daily as per the above research. Note: Pure garlic juice can be irritating to the skin when used alone, as it packs a powerful punch. For this reason, it is important to mix garlic juice with other ingredients to reduce the chances of skin irritation on the scalp. Another healthy hair salve can be made by mixing equal parts of garlic juice and coconut oil. Extract the juice from a small head of garlic using the method described above and mix the juice with a tablespoon of coconut oil (slightly warm the coconut oil by placing it in a bowl filled with warm water). Then massage the mixture into the scalp and hair and leave it on for 60 minutes before rinsing it out. This should be done twice daily as per the above research. Note: Garlic oil is different from garlic essential oil! So don’t confuse between the two. Garlic essential oil is extremely powerful and can cause extreme skin irritation if used as a hair salve and if not properly diluted. Please use garlic-infused oil and NOT garlic essential oil when treating your scalp. Garlic-infused oil can be used as a growth-promoting hair salve. Apply one tablespoon of garlic oil to your scalp and massage thoroughly, leave it on for 20 minutes or more and then rinse the oil out. This can be done two to three times per week or more often if you want. Nothing could be easier than this recipe for garlic oil—simply peel and mince garlic, then soak the garlic in warm (not hot) olive oil. Use one tablespoon of olive oil per clove of garlic, and allow the mixture to steep for one to two weeks in the refrigerator before using. Strain the minced garlic from the oil and use the oil as outlined above. Be sure to store the oil in a dark glass container in the refrigerator in order to extend its life span and prevent spoiling. Mix the garlic infused oil with the remaining ingredients and shake well. Store in the refrigerator to keep the oil from spoiling. How much time does it take to see results when using the garlic hair treatment? It takes a while before noticing results – as much as 3 months. According to the research about garlic gel for hair growth, after three months, hair re-growth was seen in 95% of the participants. There was also improvement after the first month but the best hair growth results were after 3 months of continuous usage of the garlic. How much time should I leave the garlic on my scalp to encourage hair growth? In the experiment, the participants left the 5% garlic gel for one hour on their scalp twice daily. Does the garlic treatment really work for fighting hair loss? According to the research, 95% of the participants had hair regrowth by using the 5% garlic ointment twice daily on their scalp for three months. The research was also randomized and double blind study. Randomized controlled trials are the gold standard of scientific testing for new medical interventions. Can I use dried garlic powder for hair growth instead of fresh garlic? Only fresh garlic extract has been used in the research so dried garlic powder is not recommended. Can I mix the garlic with onion juice to boost hair growth even more? Applying onion juice just by itself to your scalp was shown to fight hair loss and I wrote about it in my article on how to use onion juice for hair growth. But I couldn’t find any research about the combination of onion juice and garlic for hair loss so I cannot tell what would be the result. You can give it a try and see if it makes things better. After applying the garlic juice I am feeling more hair loss – should I stop applying the juice? I believe you’ve lost hair during massaging the scalp. I don’t believe you’ve lost the hair because of applying the garlic treatment. Too much massaging, unlike gentle massage, may cause hair loss. Massaging the scalp should boost up the blood circulation and help hair growth. Follow the garlic juice application with a gentle massage for a few weeks to see if you notice any improvement. If you don’t see any improvement, discontinue with the treatment. I don’t like the smell of the garlic – what can I do? If you really don’t like the smell, try some of the other natural treatments for hair growth – have a look at the next section of this article. – You can use rosemary to treat hair loss and promote hair growth – follow the instructions in my post on how to use rosemary for treating hair loss. – Castor oil can be beneficial for hair growth – find out how to use castor oil to improve and regrow your hair. – Onion can be used as a natural remedy for growing hair – learn how to use onion to regrow your hair. – Studies reveal: this natural ingredient can stop hair loss and regrow hair. Please give the solution of white hair.my hair goes white day by day. Have a look at my article about The Best Natural Supplements for Treating Premature Gray Hair. Grey hair is caused by copper deficiency. Lack of good mineralization in the body from eating non processed foods and not enough fresh organic fruits and vegetables. I grow Organic Garlic in Australia. It is the strongest smelling Garlic you will find anywhere!! Email me if you have any further questions ok.
bad news: onion odor stayed on me for a week!!!! Want to know more about this garlic softgel and its availability. I couldn’t find more information about the garlic gel that was used in the study. This is why there are other suggestions of how to use garlic for hair growth. If dandruff is the only problem, then you can try these natural treatments for dandruff. They smell much better than garlic and onion. Garlic, Onion, Ginger, Potato, ACV with the mother & Coffee is the best combination for maximum results. Put all in a blender will stay good for up to a week. I am 18 years old and my hair loss every day …. I have tried the garlic juice on my head but this doesn’t change anything only my hair loss day by day . I affaird of my head after 5-6 years ! When trying home remedies it usually takes several months to notice any result, so patience is required. Also not all remedies work for everyone and results vary between different people. There are several other methods that are mentioned at the end of the article, but I think the first step is to try and find if there is any underlying reason for the hair loss – is it hormonal issue, extreme stress, nutritional deficiency or something else (seem ore in my article about 10 reasons for hair loss). How much over it do you mix and how often do you use it? Hi how can we know one’s own hair loss problem either it hormonal imbalance,fungi problem, nutritional dificency or some thing ealse. ………………..& what are thire respective treatment ? Your doctor can help you finding the underlying cause and with a treatment plan. You will need to shampoo your hair. You can always combine between several methods. You can view all the methods in my article How To Make Your Hair Grow Faster: The Best Natural Ways. The whole process takes time and it’s not a quick fix, so patience is required. Yes, you can mix it with aloe vera. From what I’ve read in medical sites, most hair follicles remain alive and are ready to resume normal hair production whenever they receive the appropriate signal. I also read that hair regrowth may occur even without treatment and even after many years. You can try some of the methods mentioned in my article about regrowing hair faster naturally, but I cannot promise that you will see improvement. Every person is different, and results vary between different people. Some people will find them helpful to some degree, while for others they will not do the job, so experimenting is the best way. Also results take time and it’s not a quick fix, so patience is required. how can i mix garlic ESSENTIAL OIL and castor oil. I don’t think it’s a good idea to use garlic EO because it is very strong and can irritate the skin so you have to be very careful when using it. If however you want to experiment with it, use a very small amount – 2 drops of garlic essential oils in 1 ounce of carrier oil (shake well every single time). I would not apply it straight away on the scalp, but do a small patch test first to make sure you don’t develop any skin irritation. also don’t leave it for too long on the skin. You have to be very careful when using it. can I use garlic with coconut oil? will it be effective? are there any harm? You can try to combine the two. I don’t know how effective is it in your case as every person is different, and results may vary. It’s always a good idea to do a small skin test first to make sure you don’t develop any skin irritations. Hi,jenny I want to share wid u that I m suffering fthrom baldness.i hv done so many home as well as other treatments .pls tell me effective methods for baldness and increasing thickness of hair.pls reply me soon. Hi Priya, I guess the first step should be to identify the cause of the problem: is the hair loss a result of hormonal issue, extreme stress, nutritional deficiencies or something else? You can read more about it in my article about 10 Causes of Hair Loss. The second step is to try some of the methods to encourage hair growth. These are summarized in my article about How To Make Your Hair Grow Faster: The Best Natural Ways. These methods are not a quick fix, and patience is required. It may take several months before noticing any improvement, and results vary between different people. I have started using garlic juice and honey for hair regrowth. I learnt from some one that this formula is proven one. There is not a proven formula, as what works for one person may not work for another one, but it’s always good to give it a try. Yes you can. Test it first on a small skin patch to see that you don’t develop any skin irritation as garlic is very strong and should be diluted. My hair started falling out when i was 35 after giving birth to my only child, 5 years later i turned 40 and started menopause ,then started with hair loss , hair loss in the crown area of my head. I Went to a specialist and all she said was it may be hereditary . I have tried many things , now i’m researching how to wake up my hair follicles . Hi Edna, you can refer to my article about the best natural ways to grow your hair faster, where you can find natural methods to encourage hair growth, many of them are based on research. I just used this remedy for my hair and scalp this past weekend. I was shocked to notice how much less hair loss and shedding I had with just one rinse. Incredible! Thanks for this article. I think I will do it again this weekend just so I can maximize my results! Hi, what remedy?you didn’t say what you used. lol! Thanks Jenny for the natural recipe. However, was wondering why none of the readers have come back and posted the results after trying garlic juice etc. Because it takes a long time (usually several months) to see results, so by that time people have forgotten where they read about it. What is the age limit for this garlic treatment for hair ?? I don’t think there is an age limit for it. Is garlic helps to remove dandruff? I don’t know. You can try ACV (see more information HERE) or these home remedies. I just wanted to say that tea tree oil works great. I had a bad case of dandruff,I mixed 10 drops in 2 spoon of a mixed essential hair oils that I had. I applied the mixture to the scalp and left it for 3 days, then I added a few drops to my shampoo and conditioner and washed my hair. No more dandruff since the first application. I am 17 years old, and I start to apply garlic and onion juice can it help me in regrow of hair. I don’t know. Results vary between different people and there is no guarantee for success. To regrow hair it’s best to apply it at least 3 times a week. How many hours should the garlic paste rest ? ?and if I don’t get any irritation using raw garlic only..can I continue..or will it have have any side effects being concentrated.?? 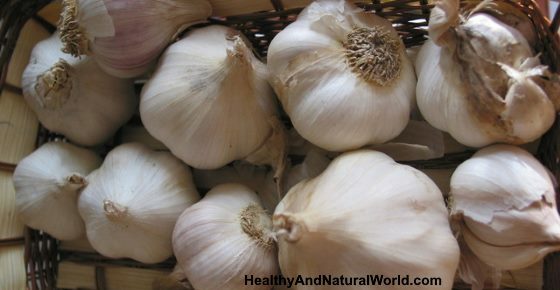 Never use raw garlic on the skin as it can burn and irritate the skin. Always dilute it as suggested in the article. According to the study mentioned in the article, the participants left the garlic application for one hour twice daily for three months. Please note that even in the study the participants used garlic gel 5% and not undiluted garlic. which could be the reason.. but i heard that garlic , little diluted is good.. I have tried onion long time ago, my hair become stronger, but here is the trick. during that that 2 or 3 months the growth cycle started again, it could have been the onion, or the sleep , i started sleeping early, it could have been paying attention to zinc i started eating pumpken seeds an excellent source of zinc, or the egg mask for hair.. which I did once in awhile.. see!! i use egg or onion and little henna on the day before the hair washing day to minimize the number of hair wash.. which in my case weaken it..
and hair came back very strong..
for a 8 months or so..
Regrowing hair is not a quick fix, and patience is required. Even commercial applications such as Minoxidil require several months until you notice a change. You must also remember that results vary between different people so there is no guarantee for success. Found your article fascinating. Would like to use you Methods two; Garlic Infused oil and Essential Oils. But I have one question: is this methods to use twice a week for 20 or 60 minutes on dry hair before or after washing your hair? To encourage hair growth you will need to use it more than twice a week if you can (please note that in the research mentioned in the article the participants applied it twice daily for three months). You don’t have to wash your hair before applying the mixture, although some people find that applying it on damp hair is easier. You will need to wash your hair afterwards as the garlic has a very potent smell and the oil will leave your scalp and hair very greasy. For other natural methods to encourage hair growth please click HERE. i shaved my head so can i apply garlic paste with olive oil on my full head or only that part there is no hair..please suggest …. You can apply it only on the patches with no hair. There is no need to shave the hair. In the study mentioned in the article, the participants left the 5% garlic gel for one hour on their scalp twice daily, and after three months hair re-growth was seen in 95% of the participants. I guess that this is what you should aim for – if possible.